Hi everyone. 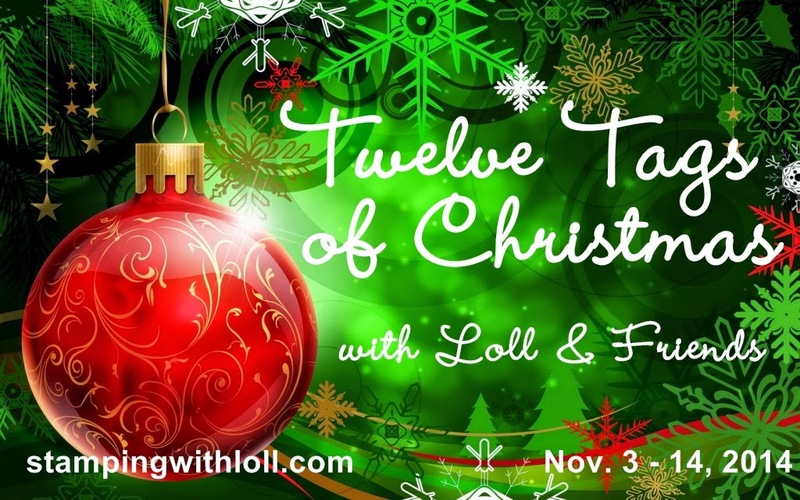 Welcome to the fifth day of my "Twelve Tags of Christmas" Event. I've had so much fun with this event and I want to thank everyone that has entered a tag or left comments. Two more tags posted here today (one made by me; one made by a friend). We hope our tags inspire you to play along! Speaking of inspiring, I hope you'll check out the tags that are in the gallery and leave some love for those who have entered ... so many gorgeous tags!! And if you have played along yet, I hope you'll join in the fun and link up your Mixed Media* Christmas tags below. The white tag (2 1/8" x 3 5/8") was sponged with Broken China, Peacock Feathers, and then a little Evergreen Bough around the edges. I folded up a couple of pieces of paper towel, and then poured water over top - this was my "stamp pad". A large snowflake stamp was pounced into the wet, and then stamped randomly over the tag. The water reacts with the distress inks and snowflake image appears lighter. The background was then splattered with diluted white paint. The trees are a die from Impression Obsession, called Fir tree border. I cut out the border, and then cut it in half to create two layers of trees. White card stock was ripped and layered to create snow banks at the bottom. Dazzling Details (clear glitter glue) adds a little sparkle along the ripped edges and all over the trees. I die-cut the Antique Lamp Post (Poppy Stamps) from black and two from white, gluing them together to make it sturdy. Yellow ink was sponged onto white card stock and a small circle (hole punch) was used as the light fixture for the lamp ...a couple of pine sprigs and a red cord bow decorates the lamp post. Sparkle Texture effect (Martha Stewart) was added for the snow on the lamp post and "joy" was cut from dark red card stock using my Silhouette Cameo. I dyed a piece of seam binding with the same dark red ink, scrunched it up, let it dry overnight, and then added to the top of my tag. Whew! :) Sounds like a lot, but it was so much fun to make! Today's special Guest Designer is Ingrid of Ingrid's Crafts Corner (check out her blog and prepare to be amazed!). I only met Ingrid recently through the Mixed Media Card Challenge. She entered two cards in the inaugural challenge in July and I was blown away with her designs. 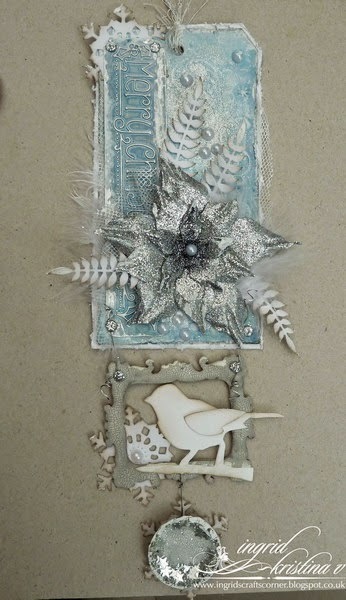 Ingrid is multi-talented … not only making the most beautiful mixed media projects, but she also makes other styles of cards. She is always experimenting with new products, and freely shares her experiences along with tips and tricks she's learned. Ingrid also makes a lot of her own embellishments, using hand-drawn templates for cutting flowers and many other items --- she is very artistic! I always learn so much when I visit her blog. She currently designs for Glitz Craft and is on the design team for Crafty Catz challenge blog. I hope you'll spend some time looking around Ingrid's blog ... you'll be glad you did! For details on how Ingrid made this gorgeous tag below, please click HERE. Hi Loll! How adorable is your tag!! All the sparkle and the snow is just a PERFECTION!! Love the little pines, that's super-cute! Gorgeous tag!! Two more Stunning tags Loll by you and Ingrid. Everyday I think that tag is my favorite and everyday you out do yourself. Your gorgeous Winter Scene is so beautifully filled with texture, color, glitter, dimension and more. TFS your tag and detailed description my friend. Loll, your tag is wonderful as ever! Love the background and the sparkly snow on the ground. The red "joy" stands out perfectly. And Ingrid's card is absolutely amazing! Ok, all I can say is I wish I was on your Christmas card list! Your tag is to die for! 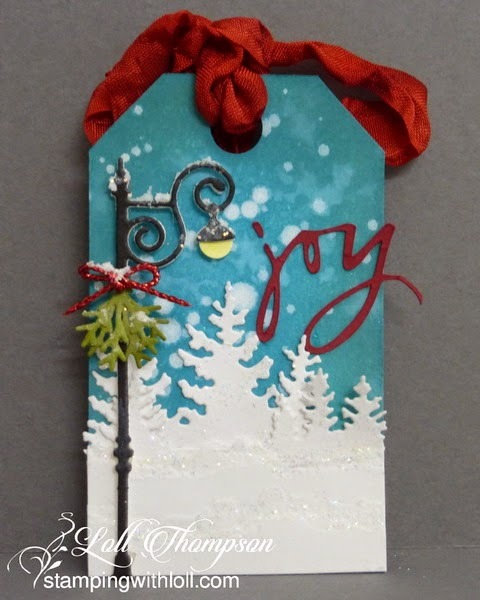 Ingrid's tag is equally gorgeous in all it's shabby chic glory! Both of these tags are stunning! Love your lamp post Loll - and Ingrid's great design with the little piece hanging off the bottom of her tag! Each tag is getting better & betterer, Miss Loll. I am so loving the dies you've used on this one. That is great detail on the lamppost greenery. The subtle snowflake etching on the pretty blue is wonderful...thanks for reminding about the ghosting. Just finished catchup on my visitors' comments so will get back to enjoy some of the wonderful daily entries. I caught a couple as I was visiting some of my visitors - & I hope to join in tomorrow. Have something in progress. Glad you are hosting this fun contest, and love the graphic at the top of the post. Hope to have that on my next tag post, after I saw Miss Bonnie feature it. Great idea. Big Hugs & Happy weekend. Gorgeous Loll. I love this color combo. wow. Ingrid's tag is a stunner too. I just found you via the fabulous Darnell, and have to say I LOVE these tags and have become your latest follower. I shall put my thinking cap on and see what I can come up with to play along! What a beautiful technique for the sky! And the lamp post all decorated for Christmas is so pretty! Love the red die cut joy and the pretty ribbon too! I think this is my favorite one yet! Two incredibly beautiful tags, stunning in every way. As I mentioned previously, I'm thrilled you've included 'how to' details, because as I read through, I 'think' I can case these (though my versions won't be nearly as amazing). Gorgeous to the nth degree! Love the colors on your tag, Loll! Such a beautiful scene! Amazing design, Ingrid! Both gorgeous. I love your diluted white paint snow. So bokeh-ish. And I love Ingrid's multi-layer creation. Wowwwwww!!! I love those white trees over that beautifully inked BG ! Ingrid's tag, needless to say its superb!